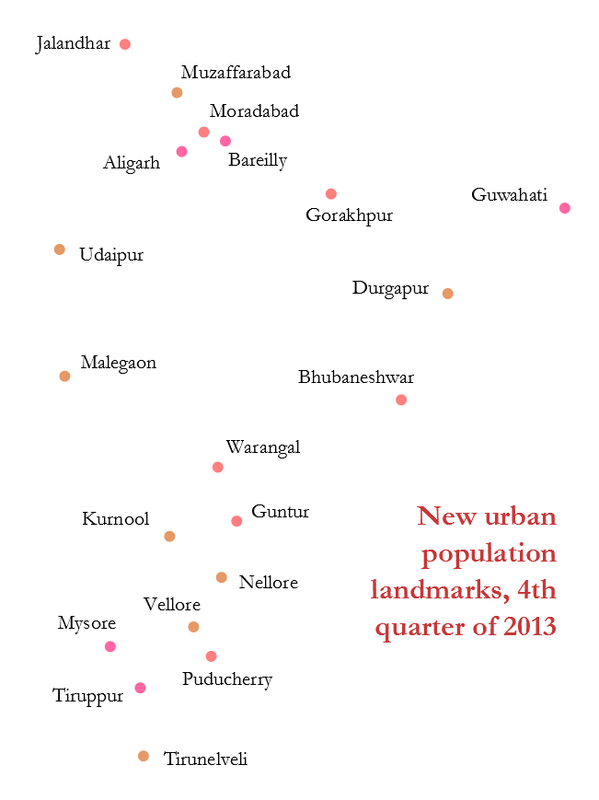 This quarter, that is October to December 2013, a number of India’s cities will cross population landmarks. The 2011 Census fixed the country’s urban population at just over 311 million, a population that had grown over ten years by 31.8% (compared with the rural population growth of 12.3%). 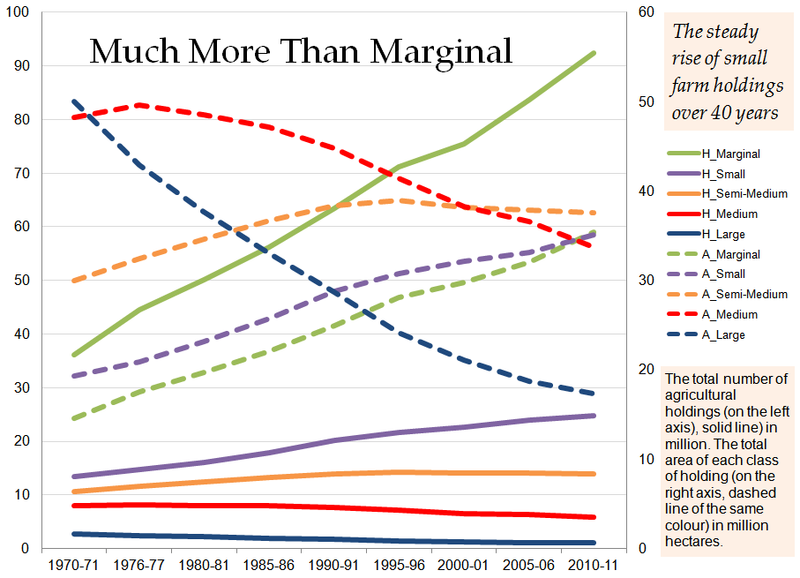 What this means is that India’s cities and towns are adding to their numbers every year and every month at roughly the decadal rate seen for 2001-11. Each urban centre has recorded its own rate of population growth but all together, the rate of growth in the populations of India’s urban settlements has raised the number of Class I towns (those with a population of 100,000 and more) to 490 – the category had 394 in 2001! * Tiruppur in Tamil Nadu (1,033,000), Aligarh in Uttar Pradesh (1,002,000), Bareilly in Uttar Pradesh (1,065,000), Mysore in Karnataka (1,047,000) and Guwahati in Assam (1,018,000) will all cross the million mark. 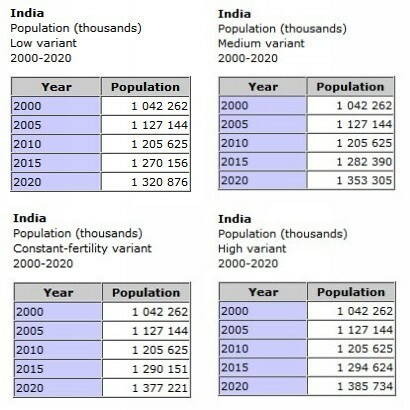 * Muzaffarabad in Uttar Pradesh (527,000), Kurnool in Andhra Pradesh (531,000), Vellore in Tamil Nadu (515,000), Udaipur in Rajasthan (504,000) and Tirunelveli in Tamil Nadu will cross the 0.5 million population mark. * Nellore in Andhra Pradesh (627,000), Malegaon in Maharashtra (614,000) and Durgapur in West Bengal (610,000) will cross the 0.6 million population mark. * Puducherry (union territory, 708,000), Guntur in Andhra Pradesh (733,000) and Gorakhpur in Uttar Pradesh (714,000) will cross the 0.7 million population mark. * Warangal in Andhra Pradesh (826,000) has crossed the 0.8 million population mark. 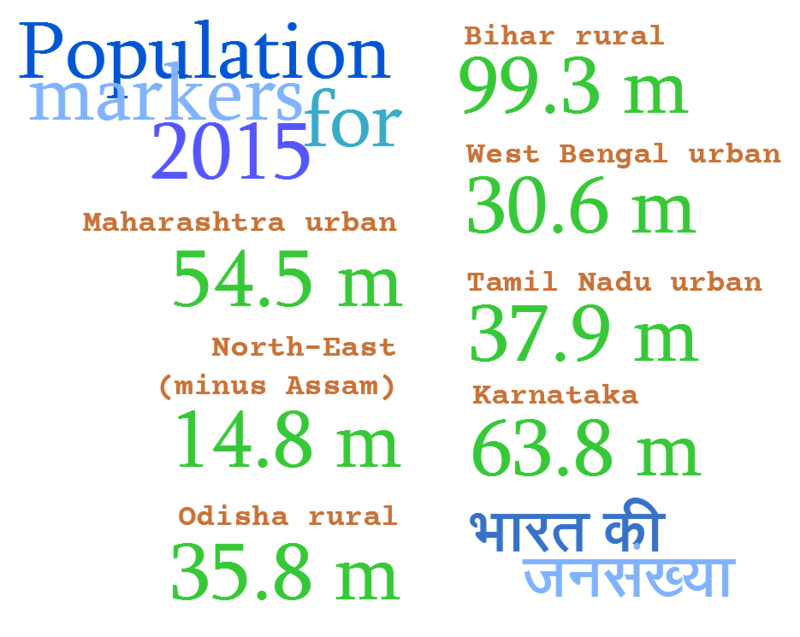 Moradabad in Uttar Pradesh (987,000), Bhubaneshwar in Odisha (967,000) and Jalandhar in Punjab (928,000) will cross the 0.9 million population mark. 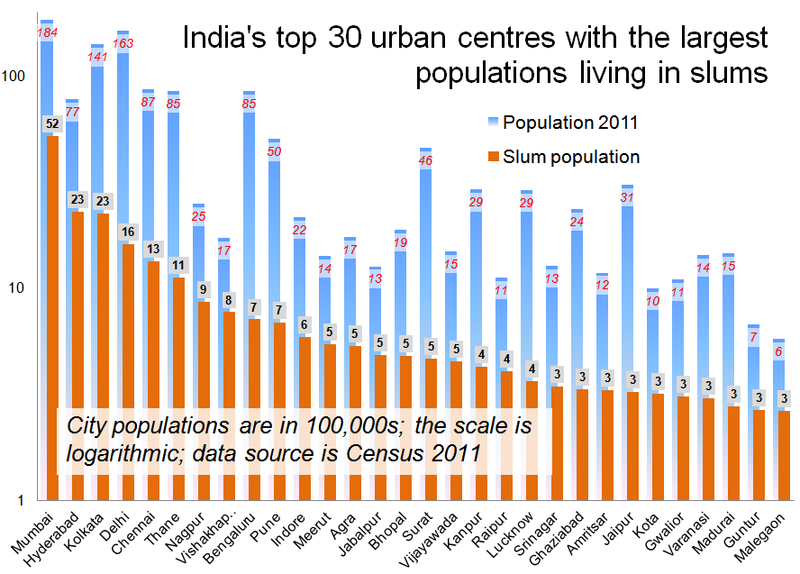 The graph illustrates the 30 largest slum populations in India, using the new Census 2011 data. 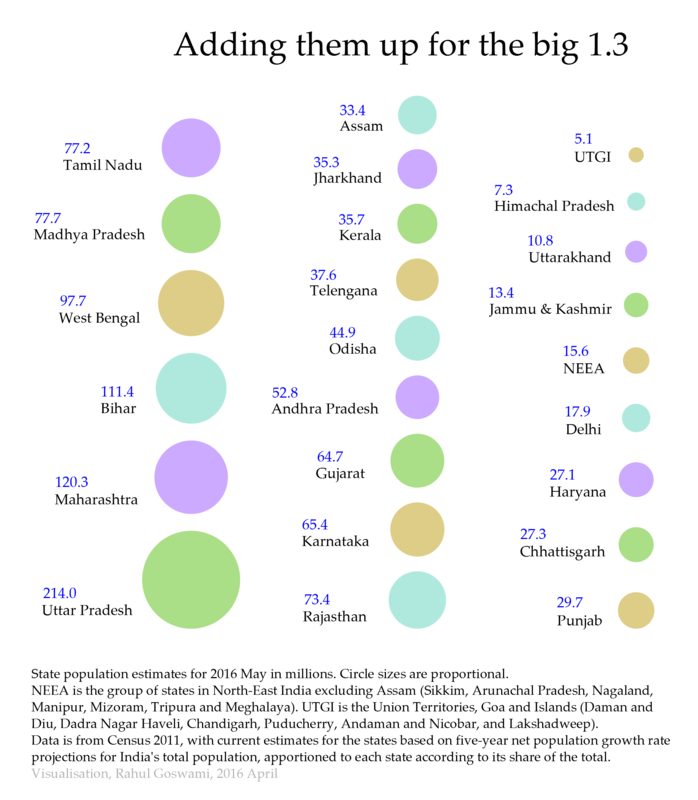 The scale is logarithmic – not proportional, else showing the largest metros would reduce the smaller cities to being unreadable – so as to better display the trend of growing slum populations in urban centres whose total populations are less than a million (like Guntur and Malegaon) and up to two million (like Kota, Gwalior, Srinagar, Raipur, Jabalpur and Meerut). We have now one important basis to consider carefully the consequences of the macro-economics of GDP growth and all the programmes to encourage such ‘growth’. In 2011, 65.49 million Indians lived in slums in our cities and towns (the number was 52 million when recorded in Census 2001). 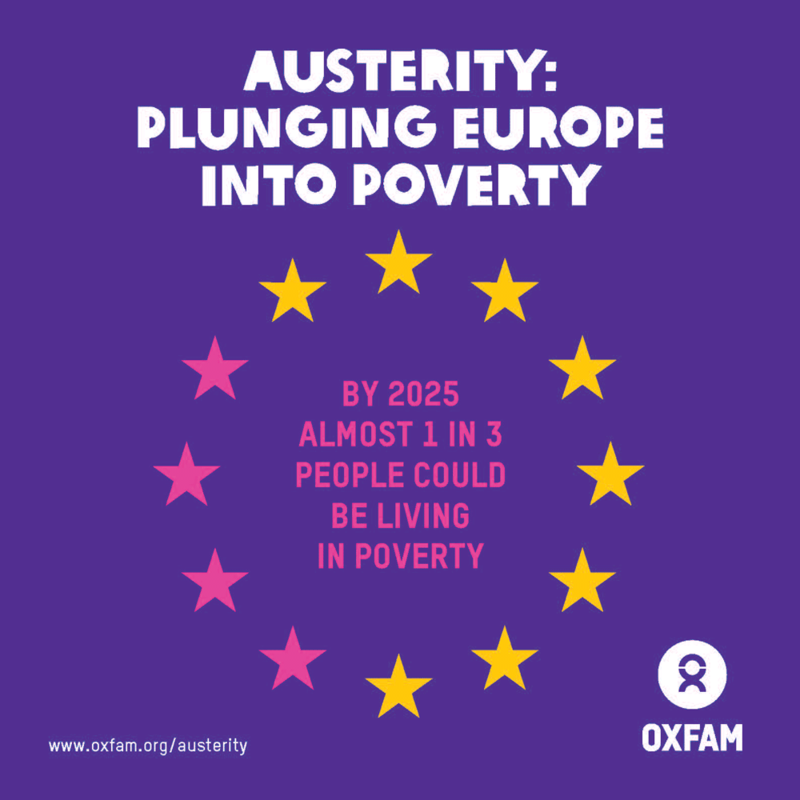 It is important not to allow the immensity of our population numbers (1,250 million now in 2013) to diminish this extraordinary and disgraceful number in any way. The 65 million who live in slums are all together a population equivalent to the populations of Thailand or France or Britain. This is also larger than the populations of Italy or Burma, South Africa or South Korea. 1. All notified areas in a town or city notified as ‘slum’ by state, union territories’ administrations or local government under any act including a ‘slum act’ may be considered notified slums (22.5 million live in notified slums). 2. All areas recognised as ‘slum’ by state, union territories administration or local government, housing and slum boards, which may have not been formally notified as slum under any act may be considered as recognised slums (20.1 million live in recognised slums). 3. A compact area of at least 300 population or about 60-70 households of poorly built congested tenements, in unhygienic environment usually with inadequate infrastructure and lacking in proper sanitary and drinking water facilities. Such areas should be identified personally by the ‘charge officer’ and also inspected by an officer nominated by the Directorate of Census Operations. 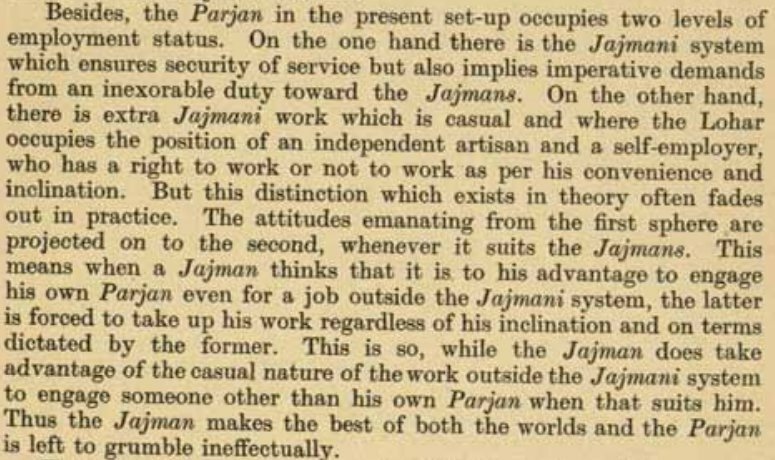 This fact must be duly recorded in the charge register. Such areas may be considered as identified slums (22.8 million live in identified slums). All those squares need to grow wheat, rice and millets for the residents of this town of 123,286 people. On this map you can see, near the centre, the town of Amalner, in the state of Maharashtra, in the district of Jalgaon. 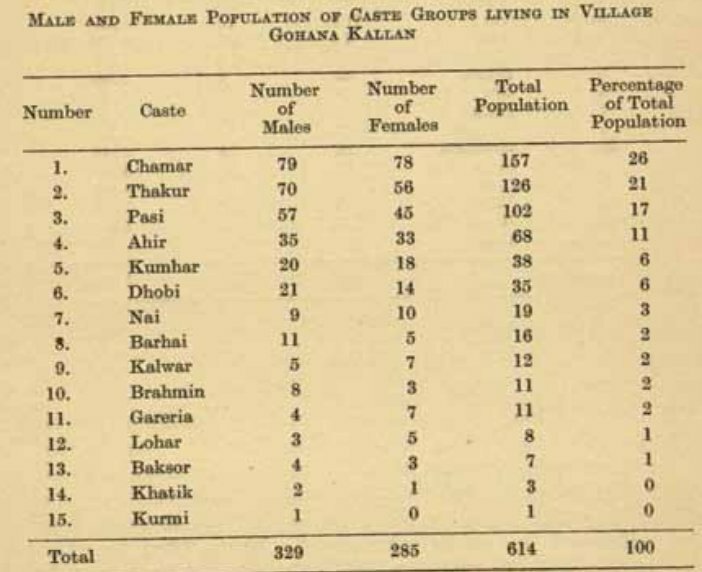 In 2001 Amalner was a Class II town, as categorised by the Census of India based on its population being under 100,000 people – its population then was 91,490. In the 2011 Census the population of Amalner was 116,750 which means the town has crossed the 100,000 mark and for the ten years between the two censuses, its population grew at just under 2.8% every year. Although rapid, that still places Amalner comfortably under the 3.4% average annual population growth rate of the 500 towns and cities whose details we have in the 2011 Census. How much food do the residents of Amalner need every year? Estimating the quantities is relatively less troublesome for cereals, whereas for pulses, vegetables, fruit, dairy and meat it is progressively more difficult and unreliable. 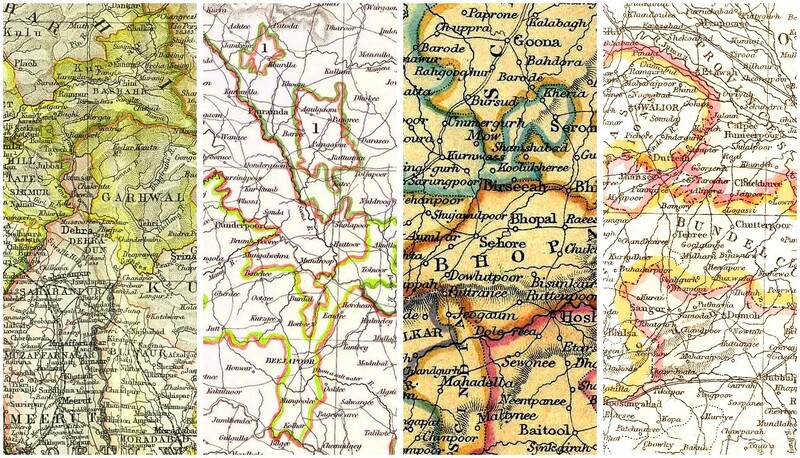 The squares on the map are scaled for the map, and that means each square is 100 hectares large at the scale of the map. They show the land area required to supply Amalner’s residents their wheat, rice and millets mix (I have taken a 40:40:20 mix as typical for Maharashtra). Crop yield data are from the Ministry of Agriculture, Department of Economics and Statistics, averaged, and adjusted for milled quantities of rice and wheat (but not millet). 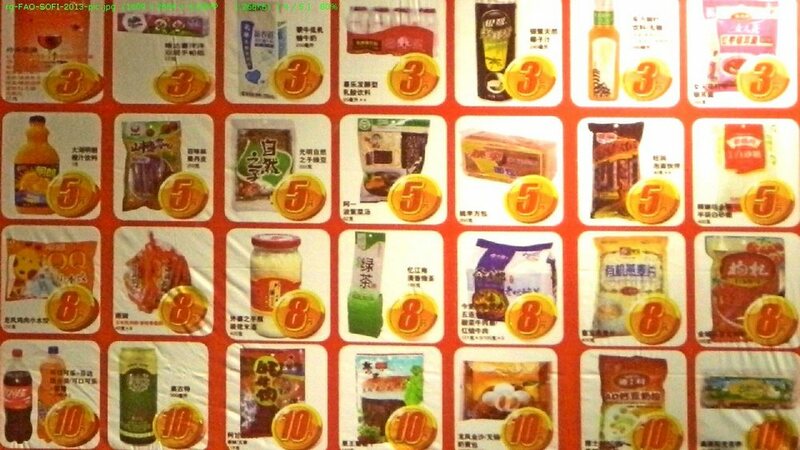 How much wheat, rice and millet? The unmilled quantities I estimated are, for 2001: 5,940 tons (wheat), 7,630 tons (rice) and 2,670 tons (millets). For 2013 the quantities are: 8,000 tons (wheat), 10,290 tons (rice) and 3,600 tons (millets). The annual cereals requirement is based on the Indian Council of Medical Research (ICMR) 2010 recommended dietary allowance (cereal 400 gm/capita/day). Now this graphic, plotted on a map that shows the urban extent of Amalner, also shows the land ‘footprint’ of cereals that a typical smaller town requires. We have now much greater interest in urban agriculture than even two years earlier, and while these networks have begun to thrive, this analysis demonstrates the dependence by urban residents on districts to supply them cereals and pulses. 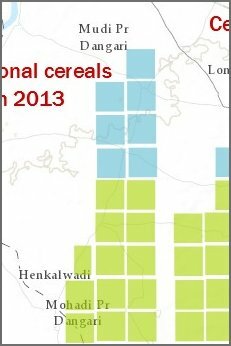 In the graphic, the squares under the caption ‘additional cereals area in 2013’ show the new hectares required to be brought under cereals cultivation to meet the calorie needs and nutritional standards for Amalner’s growing population. The use of these squares on the map serves to show why land use change for urbanisation runs quickly into physical limits – provided those physical limits are recognised and planned for. There are about 130 such urban settlements with populations of plus-minus 10,000 relative to the population of Amalner. Above this group are the cities with populations of 150,000 and above all the way to the million-plus metropolises. Below this set are the much more numerous small towns with populations of 20,000 to 100,000 and whose demand for food, and therefore on the maintenance of cultivated, is hardly known or measured. Amalner’s 2.8% population growth rate every year also tells us there are migrants coming into the town. When those additional migrants are also cultivators and former agricultural labour, what will happen to the old and new hectares the cities need to keep cultivated? 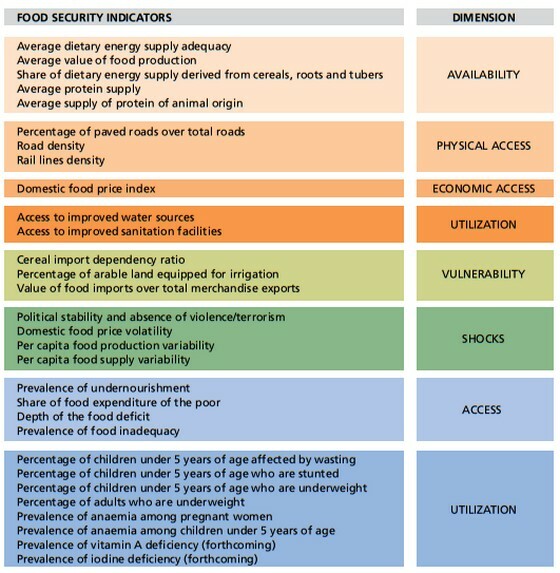 Where will the food come from?